To the tune of “One”. Sing along! Hey, cool. 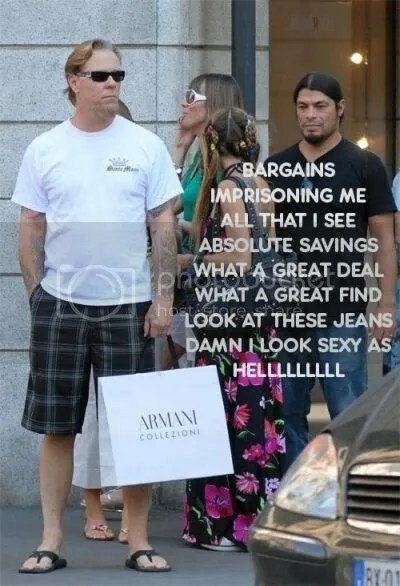 Glad to see you did a Metallica post in honor of their new album being released. I listened to the whole thing several times already. It’s definitely better than St. Anger, but so is the turd I just flushed. I’m really bothered by Hammett’s noodling solos. He’s not a bad guitarist but he doesn’t show it anymore. It just sounds so off the cuff and unstructured. Lars’ drumming the same thing. I think he’s gotten sloppier over time. I have only listened to it once so far. It’s above average, but the bulk of it is at times like And justice for all and at other times like the black album. Not my two favorite Metallica albums. I didn’t pay much attention to the solos the first time around. I think the drums sounded fine, I think Lars has always sounded fine except for the poor approach on St. Anger.